Took the Rover in for its warrant today. 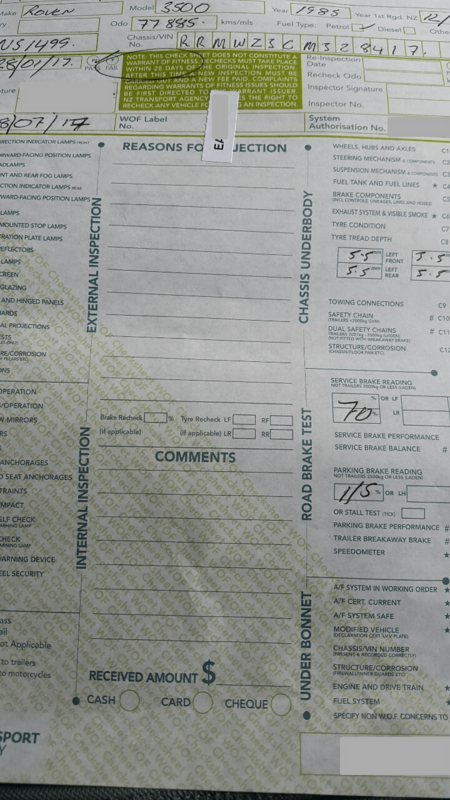 Like most classic cars, this is a nerve-wracking time, so after half an hour or so of poking and prodding, I was overjoyed when I got handed this bit of paper. Yes, that is a CLEAN SHEET! In the past couple of years worth of Warrant of Fitness sheets I have for the car, not a single one has been completely clean with not so much as a comment, let alone a failure. The tech was very impressed with the condition of the car, and even mentioned he was pleased with how well it drives, and how well things like the hand brake and steering work. So that’s another 6 months worth of being on the road. I doubt the same could be said about the car if I didn’t take over ownership of it (if it didn’t burn to the ground from the fuel leak, it would have failed on various things that I have fixed), and who knows what would have happened to it then.